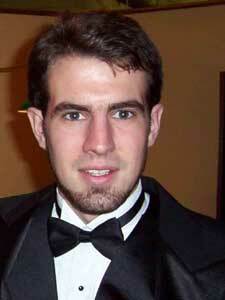 From a Southwind press release: Karl Stein will serve as Southwind's drum major for the 2005 season. "I have been involved in music for as long as I can remember," Stein said. This summer will be his seventh season marching in an "athletic musical ensemble." He played the saxophone for almost nine years before switching to low brass two years ago. For two years he marched baritone sax in the Traverse City West Senior High School marching band in Traverse City, Mich., and spent his third year there as drum major. Stein attended Northwestern Michigan College for one year, then transferred to Eastern Michigan University, where he is currently a senior pursuing his instrumental music education degree. He marched one season on sousaphone in the EMU marching band and last fall he had the privilege of being one of EMU's drum majors, he said. Stein spent the 2004 summer marching contrabass for Southwind. "Including this new role with Southwind, I have been drum major for three different marching ensembles," Stein said. "And so far, each has qualities that make the role a unique experience. This summer, I am most looking forward to being able to work with the entire horn line, as well as the battery, pit and guard, and getting to know my brothers and sisters better across the entire corps, rather than just the contra section or just the horn line," Stein said. "However, this summer I will very much miss the satisfaction of finally overcoming my instrument. I will miss the adrenaline of manhandling a 40 pound chunk of metal all day long, and I will miss the rush of my face turning blue from pressing that last note out of my contra towards a screaming audience. I'm sure being a drum major will have its own thrills and rushes, and I can't wait to see what those will be," he said. Stein will age out this August at the DCI World Championships in Foxboro, Mass.